Kyle Dennis Trading Review – The Sniper Report and a +50% winning trade! This Kyle Dennis review is by a REAL subscriber. We love the Kyle Dennis Strategy that he uses to find longer term winners in the Sniper Report. We also link to other reviews on Kyle Dennis programs. Is there a Kyle Dennis scam? Read on to find out! This Kyle Dennis trading review is my story of joining his lowest cost trading service (The Sniper Report) and how it is working out for me so far. I am no stranger to Kyle Dennis. I have followed him for years and seen his astronomical trading success first hand. I learned to trade Biotech stocks from Kyle but this was my first experience with his new longer term trading service – The Sniper Report. I was a bit skeptical about buying the service because it is so low-cost – it was $99 a year when I bought it! I was also a bit skeptical because many of the initial picks had nothing to do with the Biotech industry – which is Kyle’s forte. So is it legit or is there a dodgy Kyle Dennis scam going on? 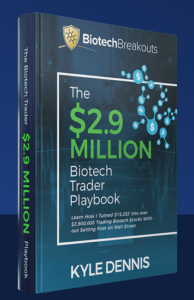 The low-cost was not really that surprising – Kyle Dennis actually gives away his entire multi-million dollar biotech trading strategy in this webinar for FREE – so he has a history of providing exceptional value. I signed up in March 2018 for the Sniper Report. It is basically a due diligence service that also alerts when Kyle buys and sells a stock. 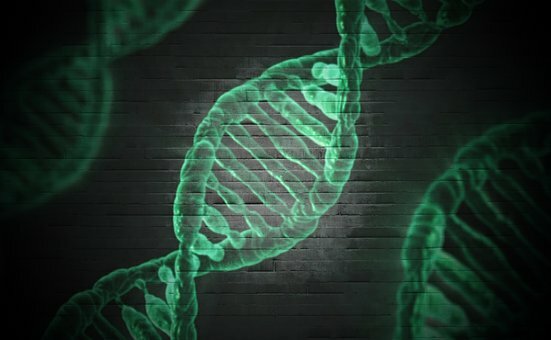 There is no chatroom access with Sniper Report – so you will need to signup for his Biotech Breakouts service if you want a chatroom community. What you get with Sniper Report is a service that delivers long term stock picks to you via email. Kyle sends out reports before and after he buys a new stock. The reports detail his due diligence into the company and they are extremely detailed. Kyle is a millionaire stock trader and teacher that turned $15k into $3 Million in about 3 years! He specializes in swing trading biotech stocks and he is VERY good at what he does. He is part of the Raging Bull trading empire and teaches people to trade alongside millionaire traders like Jason Bond and Jeff Bishop. Who is Sniper Report for? Sniper Report is for people that want to swing trade stocks that have a high chance of making them profit. You have to have the patience to hold a stock for months to see the benefits of this service. If you work a full-time job and don’t have time to day trade then this is a great stock picking service for you. The alerts are totally replicable because they are longer term picks – so there is no chasing an alert to try to get a good entry price. My experience is that it is almost always possible to buy a stock that Kyle Dennis alerts at a LOWER price than he does! It just requires some patience. In this way, his service reminds me a lot of another great stock trading service called Super Alerts. The Kyle Dennis strategy that he uses in the Sniper Report is very impressive and has led to some great gains in our stock portfolio. What Stocks Does Kyle Dennis Alert in Sniper Report? Kyle picks any stock that has huge growth potential for his longer term stock picks. He only sends the subscribers the BEST stock picks that he finds. You can choose which ones you want to invest in. I am currently invested in an interactive game company, a semiconductor technology company, biopharmaceutical company and several smart technology companies that Kyle Dennis sent due diligence on. Any company that has huge growth potential is considered carefully before being sent out to subscribers. I love the full reports that he sends so that I can go through and make my own decision on the stock. Kyle Dennis scam? Not in my opinion! Does the Kyle Dennis Strategy for Long-Term Stock Picks Work? I have been a member of the Sniper Report for 5 months now and Kyle Dennis definitely delivers some winning stock picks. 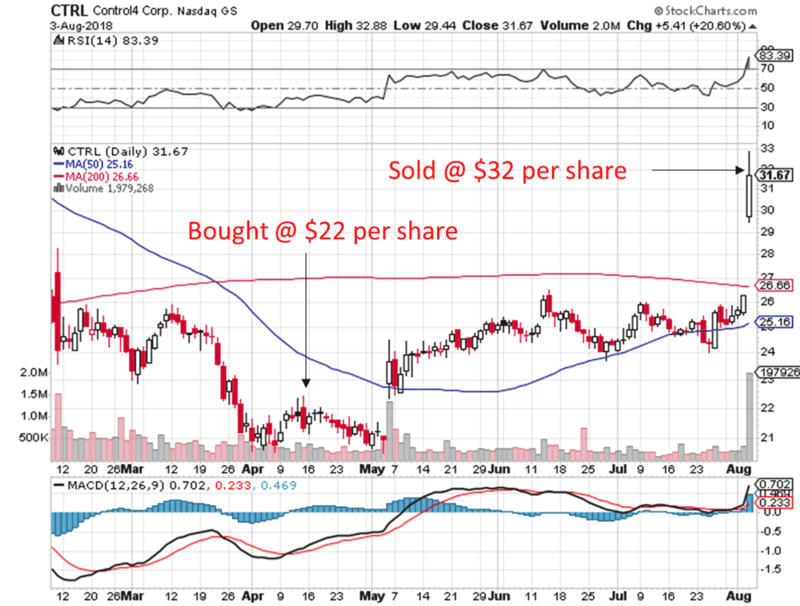 Recently we made 50% on a stock with the ticker symbol $CTRL. This is a company called Control4 Group. They are a company that Kyle identified as being an industry leader in delivering in home ‘smart’ products and services. This is something that Kyle Dennis is really good at – identifying companies that are well positioned in a trendy sector (in this case Smart Homes). He is surprisingly good at fundamental analysis of earnings and understanding year-over-year growth. This guy is not just a biotech stock gambler! 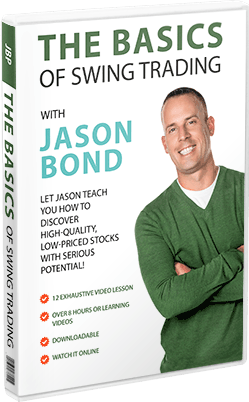 You will love the Kyle Dennis strategy for swing trading stocks! Kyle Dennis Sniper Report – $CTRL 50% gain! So based on Kyle’s due diligence and recommendation, I purchased $CTRL back in April. The daily chart is shown below – the stock went up 50% over the next few months and I just sold my position for a nice 50% profit. Not bad for doing nothing! I want to be completely transparent in this Kyle Dennis trading review. The rest of my portfolio from the Sniper Report alerts is down about 5% but I am use to volatility in these types of longer term swing trades. This is an important point if you are considering buying the Sniper Report – you really need to be comfortable with being patient and weathering some price volatility to get the most from this service. Almost all the stock picks that I have purchased in this service tend to decrease in price before exploding into profit months later. This can be difficult for a new trader to stomach. 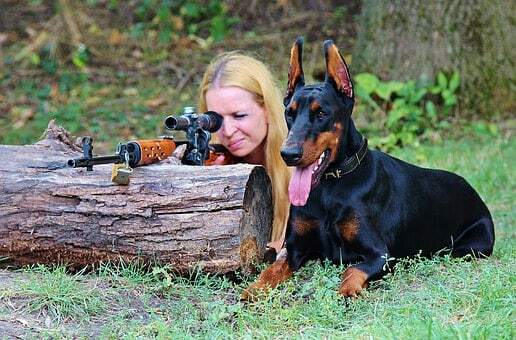 Sniper Report Review – $SELB 25% win in 3 weeks! Here is another recent example of a nice 25% win in just 3-4 weeks. 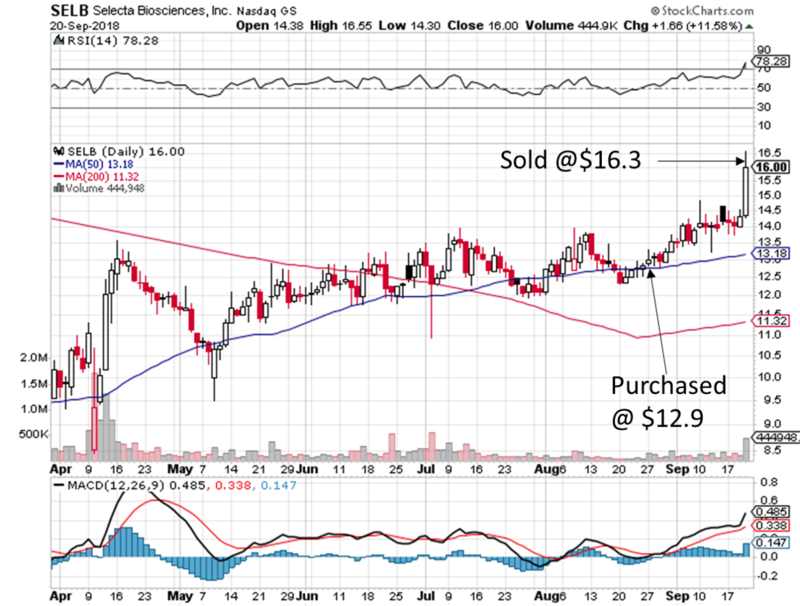 This company is another biotech called Selecta Biosciences. You can see the alert price in late August (the arrows are where I bought and sold). This was one of the rare Sniper Report alerts that immediately trended upwards in price and did not pull back. The hypothesis here was to play the run-up to data release in October at a conference. The company showed encouraging data earlier in the year that had caused a bullish growth chart complete with a golden cross in July. Their drug, called SEL-212 is used to treat gout. If the results were positive, the drug could potentially be a better alternative to the leading market candidate. This was why we entered the stock and as soon as it had a 25% move we sold. You can’t get greedy and Kyle recommends never holding through a catalyst. So a nice 25% win in just 3 weeks. Nice Sniper Report win! 25% in 3 weeks! Now tell me that there is some kind of Kyle Dennis scam going on! Kyle Dennis Review – Another big winner in the Sniper Report! Here is another recent big win that we made in the Sniper Report. The stock is called $TTWO. 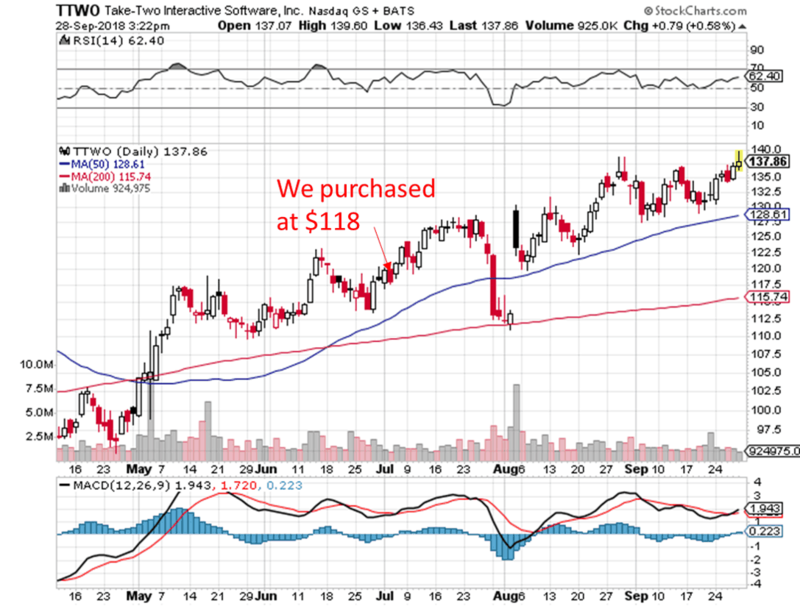 We bought this stock back in July at about $118 per share. The company is called Take-Two Interactive and they are in the gaming space. What was most impressive about this alert by Kyle Dennis is that the report he sent out was very, very comprehensive. It was literally dozens of in-depth pages all about the bullish hypothesis. Needless to say, I was very impressed with the detailed due diligence and the performance of the stock has been inline with this hypothesis (see the chart below). We are currently up $20 per share on this stock. The Kyle Dennis Strategy works! We are up $20 per share on this stock! I really don’t think that there is a Kyle Dennis scam problem! $CTRL is not the only stock that has worked well for me in the Sniper Report. Almost all of the stocks that Kyle Dennis has alerted and provided due diligence on have increased 20%+ which is awesome. A snapshot of the Sniper Report portfolio as of 9/21/18 is shown below. You can see the stocks are generally winners and the portfolio is currently up nearly 20% in just a few months. We have replicated this performance almost exactly, which is the advantage of this style of longer term swing trading. We may have actually done a little better than Kyle….. 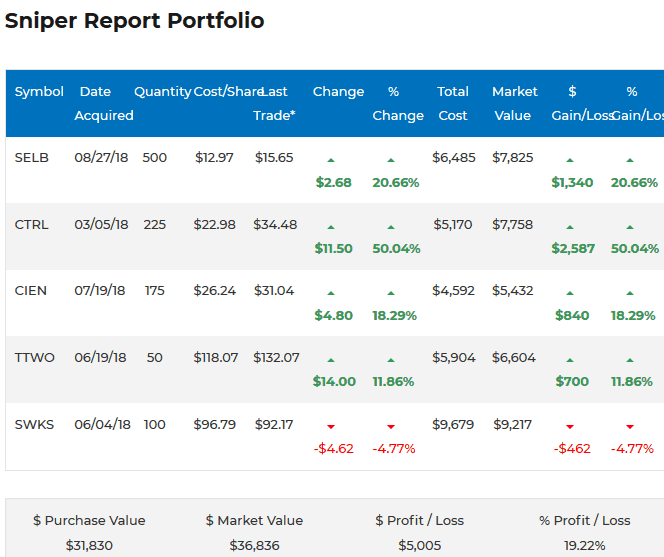 The Sniper Report Portfolio results a few months after starting…nearly 20% profit! 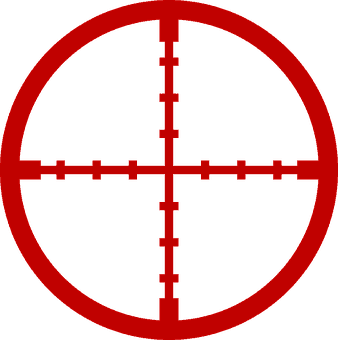 Sniper Report – What Else is Included? You get access to an extensive video lesson library and the ability to view Kyle’s current stock portfolio. The video lessons are very useful and worth a decent amount of money. There are hundreds of lessons about biotech trading, how to find insider information, options trading and so much more! I think that a lot of the video lessons come from his more expensive courses and services so it is quite a bargain to have them included in the Sniper Report subscription. But that is pretty much it for this service. This makes it perfect for experienced traders that are looking for some help finding great stocks. The beginner might need more than this service supplies in my opinion. You can learn the Kyle Dennis strategy for FREE with this webinar and eBook! I have been a member of the other stock trading services that Kyle runs. They are all amazing and I highly recommend them all! Here are my favorites! These Kyle Dennis trading reviews explain some of his other strategies. Kyle also does offer a great free webinar trading session that I wrote about here. Kyle turned a few thousand dollars into millions over 3 years so you can be sure that the guy knows his stuff. If you need that chatroom community, then you will have to pay more for that with his Nucleus Service. To be honest I think that FDA Insider is probably the best service he offers in terms of value for money – it is the service that has made me the most money over the last year or so. Reviews on Kyle Dennis program tend to be vague and don’t show the transparency that you need to make a decision. In this Kyle Dennis trading review I have tried to explain why I think that you will benefit from subscribing to his lowest cost stock picking service – The Sniper Report. The price of Sniper Report is $199 per year but I was able to join for $99 per year during one of the Raging Bull discount sales. If you want to wait and see if you can get it for 50% off then I highly recommend signing up for the free stock newsletter (just put your email into get the FREE training webinar as well!) and they will tell you via email when discount sales are occurring. Overall, I love the Sniper Report and it works really well for busy people that just want to buy a stock and let it run up into its next earnings report. Was there any thing I disliked about the service? No, not for the price! It would be nice to have a chatroom but you would pay 10 times the price for that. I hope that you have enjoyed this Kyle Dennis Review and my insight into his lowest cost trading service. I also hope that I have put to rest any idea of a Kyle Dennis scam. Other Kyle Dennis trading reviews are usually less transparent, so please share this article on social media! Kyle Dennis Trading Review of the Sniper Report found a really superb long term trading service that is a must join! I hope that you have enjoyed this Kyle Dennis Review and consider the Sniper Report service. The Sniper Report is Fantastic! Highly recommended.